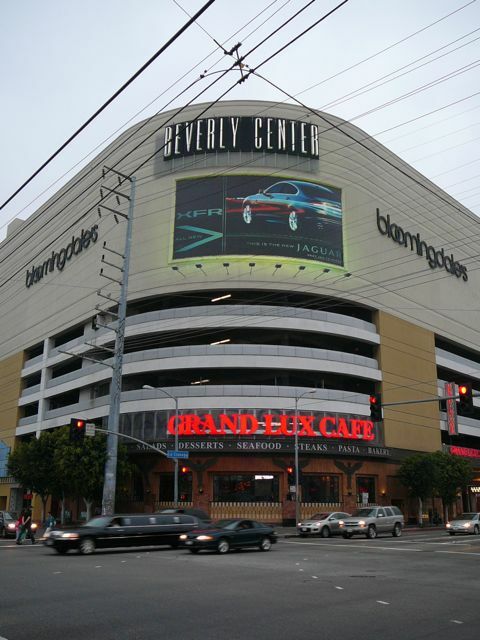 The Beverly Center is an eight story enclosed shopping center located at the corner of La Cienega Blvd. 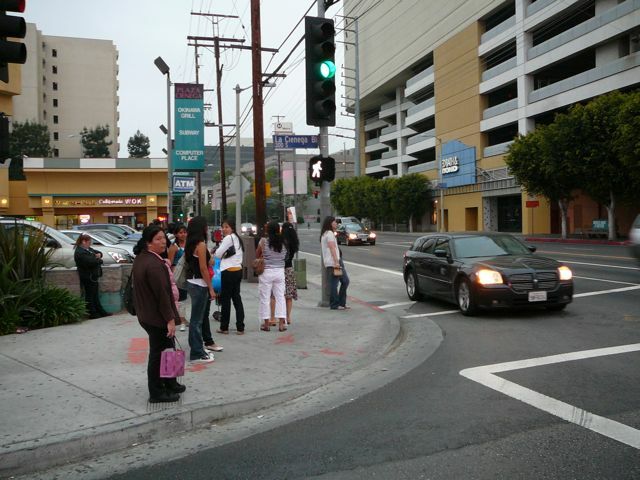 and 3rd Street in Los Angeles. Despite it's name, it's actually not located in Beverly Hills. The Beverly Center is near Beverly Hills, but technically located in the city of Los Angeles. I mentioned driving by the Beverly Center in a blog post a couple weeks back. The building consists of a massive five story parking garage, topped by a three story shopping mall. But wait, there's more: according to our friends at wikipedia, "The mall's unusual shape and lack of street frontage along San Vincent Blvd is due to it's location on top of the Salt Lake Oil Field. The western portion of the mall property contains a cluster of oil wells, all operated by Plains Exploration & Production, in a drilling enclosure that is active to this date." Yep, the entire complex is built on top of an opperating oil field. 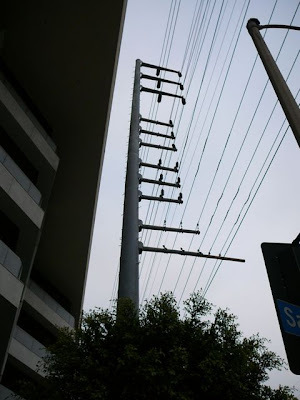 Another feature is the massive and, personally what I find very ugly, power lines up and down both La Cienega Blvd. and 3rd Street. But enough on the outside, let's head in and take a look, shall we? My wife Molly and I were having an anniversary dinner in Beverly Hills in May of 2009, back when we lived in L.A. I had driven by the Beverly Center a zillion times, but never been inside. My wife hadn't been inside since the early 1990's when she was working at UCLA. We decided to take a look. We found street parking (yes!) a block away and headed over. 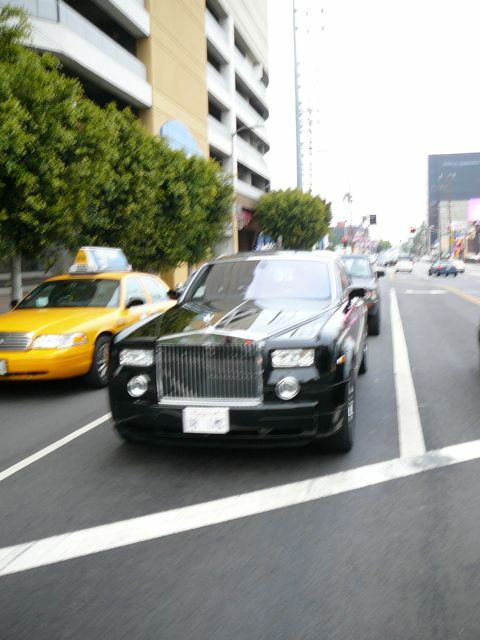 Looks like if I'm going to take a picture of a Rolls Royce, I gonna have to hold my camera still. Sorry it's blurry; took in while running across the street. Despite the massive parking garage, we still saw a lot of people coming an going via the street entrances, which consists of a series of elevators along the side of the building. Yes, you have to take five different elevators up just to get inside. It reminded me slightly of the George Pompidou Center in Paris. The inside was OK, but felt a little . . . . underwhelming. 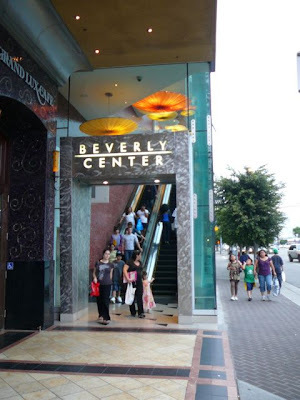 The Beverly Center opened in 1982, making it thirty years old this year. I guess this was all state of the art back in the day, but it looks like pretty much every other mall in America. 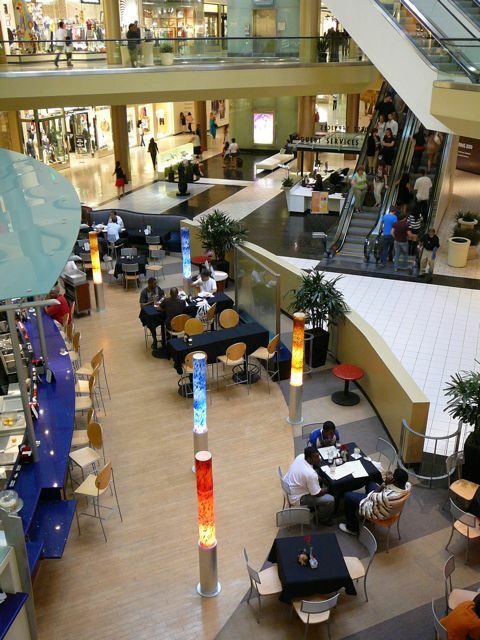 I'm curious, what's the normal "life span" of a mall? 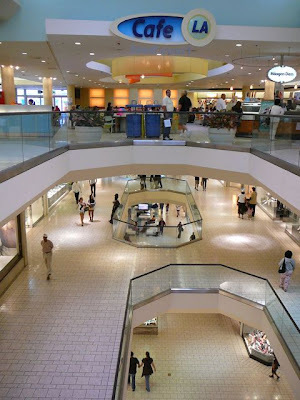 It also felt really empty, especially being in center of a big town like L.A.
My guess is that Steve Caruiso's "The Grove" complex - located just one mile to the east - has taken up all the slack, and (unfortunately for the Beverly Center) the crowds. Here's a link to some thoughts from a previous blog post on "The Grove." 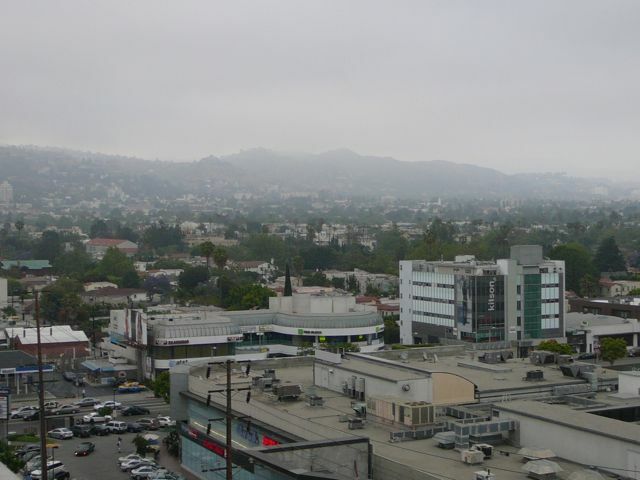 This was the view off the outdoor dining patio on the 8th floor, looking northwest towards the Hollywood Hills - and the Hollywood Sign around 7pm. 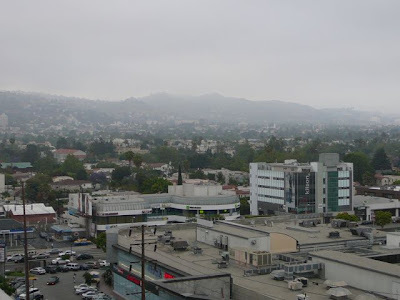 Los Angeles (and the rest of coastal Southern California) experiences a unique weather pattern in late Spring and early Summer called "June Gloom" - or, in this case, "May Gray" - with late night and early morning fog. Really nice view of the city; I bet this patio would be great when it's sunny. 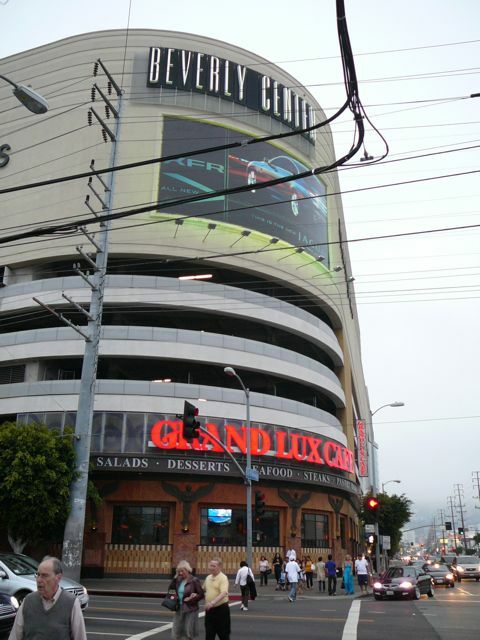 Another view of the Beverly Center, standing on the southeast corner of La Cienega Blvd. and 3rd Street. 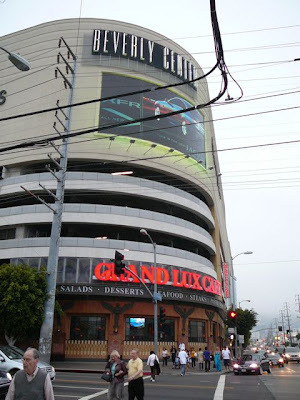 What I didn't know was that just one block from here, at the corner of La Cienega and Beverly Blvds is the epicenter of the Hollywood entertainment industry. A friend from the church we were part of in L.A., who works at Sony, explained that there is a thirty mile radius from the intersection of La Cienega and Beverly Blvds, called the Thirty Mile Zone or Studio Zone. The entertainment industry labor unions use this to determine the labor rates. Filming anything outside the zone is much, much more expensive. That explains why, for example, it was so much cheaper for a studio to turn two block of Sunset Blvd in L.A. into Santa Barbara, than actually go to Santa Barbara (here's a link to a previous blog post on that). Out and about, heading back to our car. 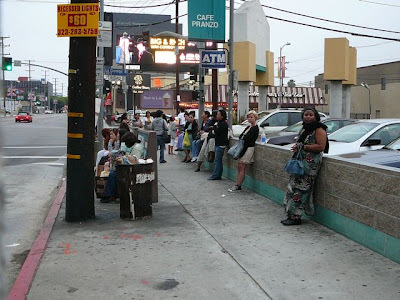 Anybody remember that old song by Missing Persons "Walking in L.A."? 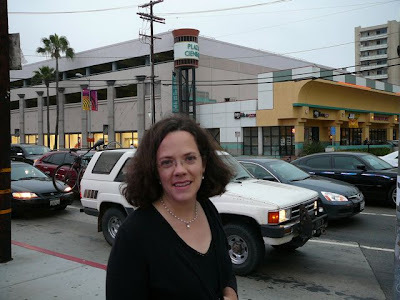 I don't know - I did a lot of walking in L.A. (here's a link to a good personal example). And we saw a lot of people out and about. OK, so these people aren't walking. They're waiting for the bus. But this feels like just as much as experiencing L.A. as walking around the Beverly Center. 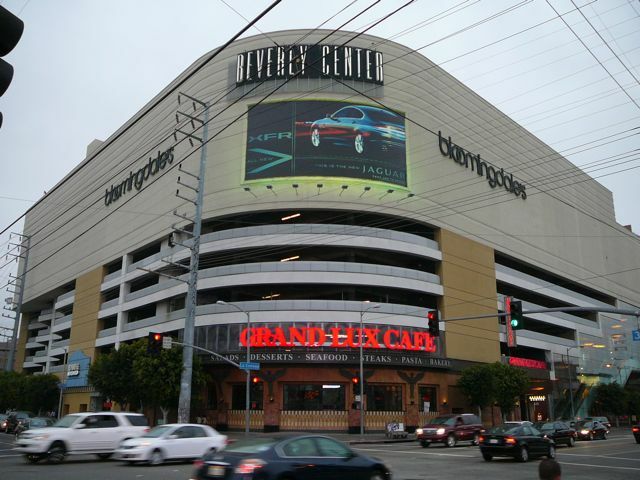 The Beverly Center is located three miles north of the Santa Monica Freeway on La Cienega Blvd in the heart of Los Angeles. It's thirty years old? Give it another thirty years and it'll probably be converted into a Korean evangelical church (I'm not entirely kidding).